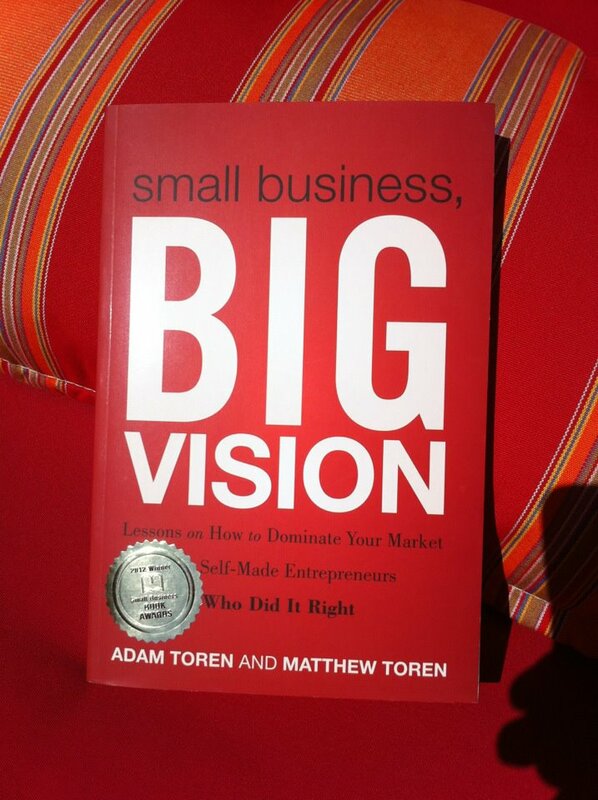 My brother Matthew and I would like to thank all of you who helped make Small Business, BIG Vision the 2012 Gold Award Winning Small Business Book. We’re proud and honored to have won the award, and we appreciate all the support we have received from so many of our readers. And from what we know, most find there’s more to the book than just reading it. 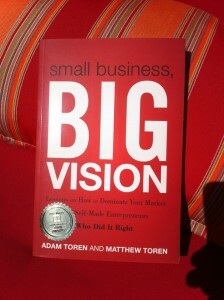 Small Business, BIG Vision may be an interesting and valuable read cover-to-cover, but if that’s the only way you use this book, you’ve only gotten half of the benefit from it. 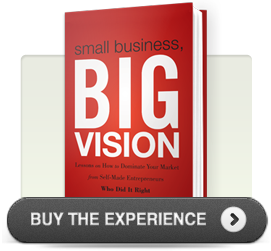 With a combination of big-view insights, stories of success, and real-world everyday ideas to apply to your business, we think SBBV is a good read and also a good resource. When you read a book from start to finish, much of its information gets lost in the process. There’s a communication concept that’s known as “Primacy/Recency.” This means that we tend to remember the first and last things we read much more than everything in the middle. To avoid losing that valuable insight, chop up your learning. This also works well for a non-reader. Here are some tactics we’ve used with our favorite business books. We hope some of these ideas help you to take full advantage of SBBV. Copy and cut. As you read, are there concepts that strike you as valuable – possibly too valuable to just read past? Copy that page and cut out just the piece that drew your attention. Enlarge it and place in a file folder. As you continue through the book, copy and clip the concept highlights. Post one of these on a nearby bulletin board or on a wall by your desk. Change them out as they become too familiar. Over time, you will own those concepts. Story power: SBBV is full of first-hand tales of successful entrepreneurs. Each had his or her own style, but every one of them found a path to success. How about reading one of those stories every Monday morning before you write your plans for the day or the week? As you read it, think about how that entrepreneur’s approach might apply to your business. Did he or she use tactics that might make your company stronger? Does this week’s entrepreneur have qualities that you would like to develop in yourself? Over the course of the week when faced with a decision ask yourself, how would this week’s entrepreneur handle this? Tidbits: Every page of our book includes hands-on tips and suggestions to help your business run more effectively. Employee issues, contemporary marketing tools such as social media, and developing and writing a business plan are covered in straightforward and practical ways. When a topic is discussed that you know has come up or will come up as you build your business, make sure you can track down the source. Buy some of those page-market post-its, position them as appropriate in the book, and write a few keywords down on the flap. By the time you finish, you will have bookmarked every important area for easy reference. Sharing: If you read something that you’d like everyone else in your organization to understand, tuck a brief quote in a memo, add it to a staff meeting agenda, or leave a copy of SBBV in the break room with a page marker and a note encouraging everyone to read it over coffee. Every member of an entrepreneurial organization will perform better if their understanding of the goals and challenges are improved. Inspiration: Sometimes being an entrepreneur can seem overwhelming and discouraging. Grab some of the inspiring quotes and phrases we added to Small Business, BIG Vision and let them motivate you on those tough days. We wrote this book with the hope that it would be read, paged through, used, and generally kept handy on every entrepreneur’s bookshelf. We hope you agree that reading it is just the start. Just found your site and you are now bookmarked! Looking forward to integrating your ideas into my own journey! Thanks.